Apply for a Temporary Resident Visa using Form IMM 5257. Form IMM 5257 is used by individuals who want to apply for a Temporary Resident Visa (TRV) to visit Canada for a temporary purpose such as tourism, visiting family or friends, or business trips. A Temporary Resident Visa (TRV) is the official document issued by a Canadian visa office that is placed in your passport to indicate that you have met the requirements for admission to Canada as a temporary resident (either as a visitor, a student, or a worker). Note: Individuals must obtain a TRV before departure from their home country. 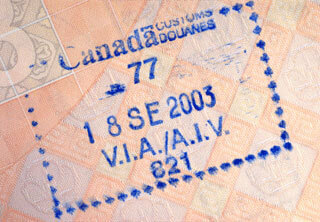 Individuals cannot obtain a TRV upon arrival in Canada. Individuals who are not Canadian citizens or permanent residents of Canada may require a visa to enter Canada. The requirement for a visa also applies to temporary residents who are transiting in Canada. Please visit the IRCC (formerly known as CIC) site at http://www.cic.gc.ca/english/information/applications/guides/5256ETOC.asp for more information on individuals who are exempt from obtaining a Temporary Resident Visa to visit Canada.